Following the tragic killing of an abused dog by the ASPCA in New York City, despite the offer of a No Kill sanctuary to guarantee her lifetime care, two New York State legislators have introduced a bill to prevent this from happening again. Named after the dog sacrificed to expediency by the ASPCA, “Oreo’s Law” would make it illegal for a shelter in New York State to kill an animal if a rescue group or No Kill shelter is willing to save that animal’s life. Modeled after a successful California law, Oreo’s Law would save animals who are healthy and friendly but who shelters are threatening to kill. It will save sick, injured, or traumatized animals like Oreo in cases where No Kill shelters and rescue groups have the ability to rehabilitate them or provide lifetime care. 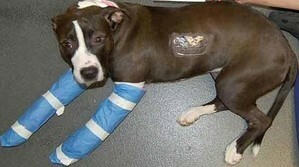 It will save animals who a shelter claims are “aggressive” even though they are not or may be rehabilitatable. It would save feral cats at shelters which oppose TNR programs and which are determined to kill them. And it will provide a form of whistleblower protection for animal rescuers by protecting their right to continue to save animals when they expose inhumane conditions at shelters. Currently, shelters can retaliate by barring them and killing the animals they want to save if they go public with concerns. By seeking to limit what is now the almost unrestrained power to kill animals by shelters, and because it empowers those who want to save animals from those who are threatening to kill them, Oreo’s Law is central to the fight for a No Kill nation.